So we got one good outcome followed by one #$@%^ outcome. 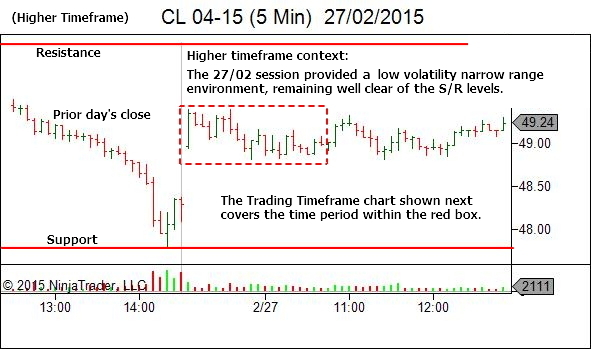 There are more trades coming and they require your full attention. Plus… in the big scheme of things any one individual trade is IRRELEVANT. Human decision making is flawed. 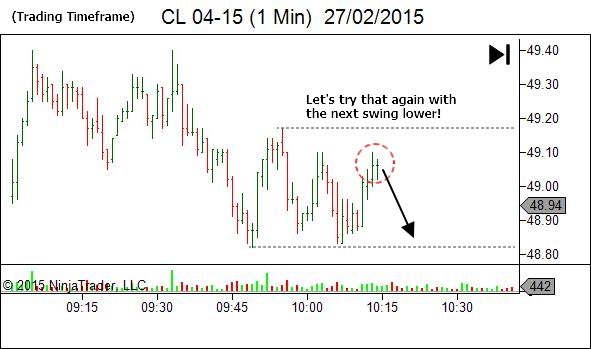 Trade entry decisions will at times be outstanding. 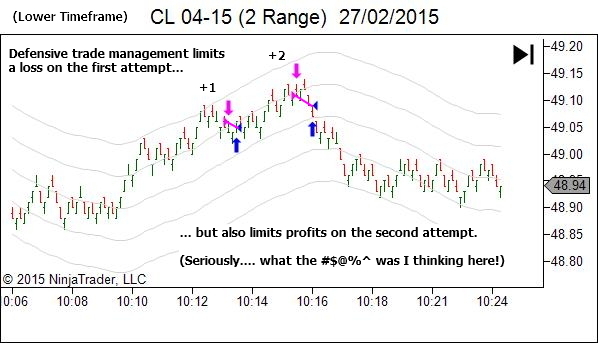 But at other times, looking at the charts with the benefit of hindsight, we'll wonder what on Earth we were thinking! Trade management decisions will at times be perfect, leading to a far greater outcome than you would typically expect to get for that sequence of price action. And at other times, such as in the second trade sequence above, our trade management decisions will lead to significant underperformance when reviewed with hindsight. Sometimes we underperform. Sometimes we outperform. Ultimately though, individual trade results do not matter. We don't profit from any one trade. We profit from management of risk and opportunity over a SERIES OF TRADES. 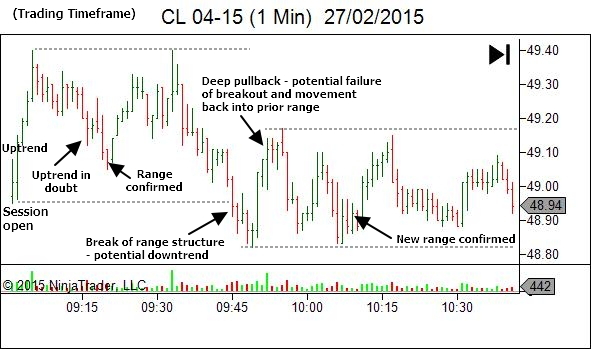 Successful trading INCLUDES #$@%^ outcome trades! By all means work to reduce their frequency and their negative impact upon your equity balance. But you HAVE TO accept that they're part of the game. Provided you've kept risk contained within your pre-accepted risk parameters, then DON'T BEAT YOURSELF UP. Average win should always be larger than average loss no doubt , I think not enough emphasis is put on trade success ratios a lot of the time though . I have some tables on losing trade steak probabilities based on trade success percentages that are very enlightening , I work very hard on keeping trade success rate very high , there are ugly trades we all have taken that if we rid ourselves of will markedly improve the bottom line . I have a mantra that any trade setup that is less than 50% success is straight in the bin , the better the trade success rate the lower the occurrence of high multiple consecutive losing trades , long losing streaks are bad for the psyche . If you can keep trade success rate >70% the losing streaks should never be large enough to damage the mental ability to pull the trigger There is absolutely no doubt if you keep losses smaller than gains and have more winning trades than losers you make money . 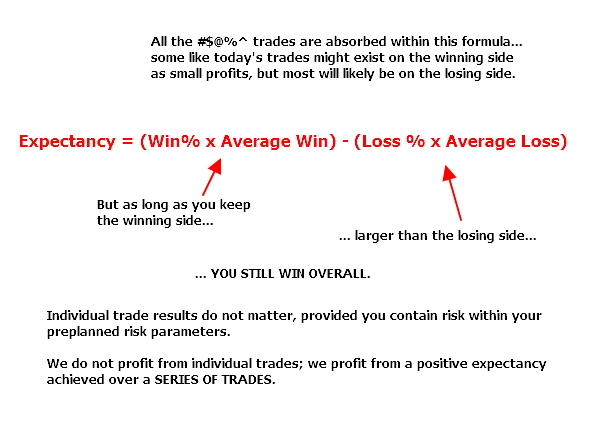 To some degree our trading style requires a tradeoff between win% and win/loss size ratio. There are traders out there who can operate quite comfortably with a 30-40% win rate, but they profit through a higher win/loss size ratio when they catch a monster trend. I’m with you though… that is NOT how I like to operate. I much prefer to seek higher win percentages and minimise the psych capital drawdown that is associated with strings of losses. That being said, I find it interesting you say there is not enough emphasis on “trade success ratios”, by which I’m assuming you mean win%. I find it to be the opposite. There would not be a week go by where I don’t get emails asking about how to improve win%. And yet I can probably count on one hand the number of times someone has emailed me to discuss their win/loss size ratio, across the whole 6+ years I’ve been doing this. By all means work to have psychological acceptable win percentages. 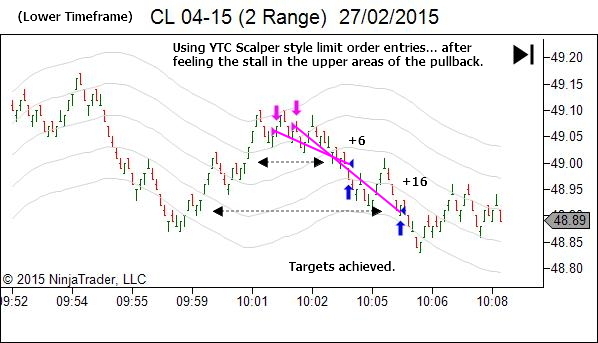 But then apply equal or more emphasis on how to maximise the profit out of these setups. Just my thoughts of course! Accurate stats for a discretionary trader… that’s a whole other issue. Your methods of coding formula to define setups and using this to assign probabilities across historical samples, is not so much applicable in the world of discretionary trading. Yes, by all means start your own blog if that interests you. It doesn’t apply here though. As a discretionary trader it’s not completely possible to quantify my decision making. As such, my expected win% needs to be determined over time from actual results (forward testing). Ongoing tracking measures current performance (most recent 20 trades minimum) in order to compare this performance with near term and long term historical averages; primarily to monitor for any significant deviation from these norms. In other words… my setups do not provide my edge. This is a performance activity and my edge comes from my ability to assess and manage short-term opportunity within my setup areas. My skill at this task determines whether or not I have a positive or negative edge across any sample of trades. My comment wasn’t meant to chase you away! 🙂 Just stating that this site is not the place for coding and systems trading and all related discussions. 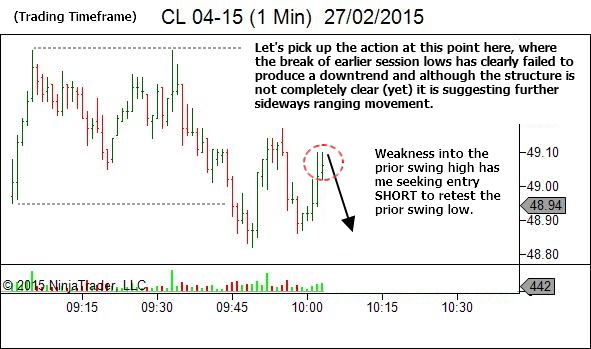 Its focus is solely low timeframe discretionary price action trading. If you do start a blog though, let me know the URL. I’d love to add it to my RSS feed to follow along for a while. I think most discretionary traders love the process of trading. I’d prefer to follow price action and make my trading decisions, than inventing algos. Just my preference. Great article Mr Beggs, I appreciate the time and effort.